The Janata Dal (United) on Sunday said it would vote against the controversial Citizenship (Amendment) Bill when it is tabled in the Rajya Sabha, notwithstanding the party's alliance with the BJP. JD(U) national general secretary and chief spokesman K.C. Tyagi said this while criticising the Congress for staging a walkout from the Lok Sabha when the Citizenship (Amendment) Bill was being put to vote, saying it was a "farce" and "tantamount to support". 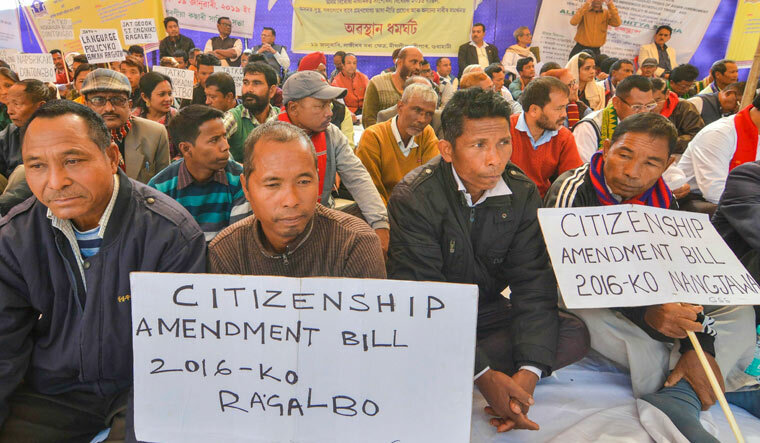 A large section of the people and several organisations in the northeast have opposed the Citizenship (Amendment) Bill, saying it would nullify the provisions of the Assam Accord of 1985, which fixed March 24, 1971, as the cut-off date for deportation of illegal immigrants irrespective of religion. Tyagi was speaking to reporters after a meeting of the party's national office-bearers in Patna at the residence of Chief Minister Nitish Kumar, who heads the JD(U). Poll strategist-turned-politician Prashant Kishor, who joined the party in September last year and was elevated to the post of national vice-president a few weeks later, was among those who attended the meeting chaired by Kumar. "The national office-bearers of the party reaffirmed the commitment to the legacy of socialist movement and to our old stand on issues like Ram temple, Article 370 and uniform civil code," Tyagi said. "As far as the new Citizenship Bill concerning Assam is concerned, we condemn the attitude and behaviour of the Congress when the bill was put to vote in the Lok Sabha," he added. “Staging a walkout is tantamount to support and it is our apprehension that the Congress, by enacting a farce, wants to support the bill. We are going to oppose it when it comes before the Rajya Sabha,” Tyagi said further. The stance of JD(U) assumes significance in the backdrop of the BJP, its ally in Bihar, facing the heat on the issue in Assam where it is in power and has lost the support of its former ally Asom Gana Parishad following differences on the Citizenship (Amendment) Bill. The JD(U) leader also said a party delegation, which would comprise Kishor and himself, among others, would soon visit Assam to take stock of the ramifications of the Citizenship (Amendment) Bill. Tyagi further said that the JD(U) will hold its national executive meeting in Patna in the last week of February. "State president Vashishtha Narayan Singh has been assigned the task of deciding candidates for the seats, which our party will be contesting in the Lok Sabha polls," he said. "He will be assisted by Rajiv Ranjan Singh alias Lalan and Vijendra Yadav, both of whom have headed the state unit in the past," he added. The JD(U) is slated to contest 17 out of 40 Lok Sabha seats in the state, as per the arrangement it has reached with alliance partners BJP and Ram Vilas Paswan's Lok Janshakti Party (LJP). Pavan Varma, another JD(U) national general secretary present at the meeting, said, "Our differences with the BJP on controversial issues is on principles and do not in any way violate coalition 'dharma'. We do not think it would lead to any misgivings as we have taken our stand on each of these issues after informing the BJP beforehand," he said. Replying to a query, he said the JD(U) was confident that the constituents of the BJP-led National Democratic Alliance (NDA) will finalise the seats to be contested by each party by the end of February, before the poll schedule is announced.